Jhansi red granite all over the world at various hotels, restaurants, casinos, bars, offices, spas & saunas and health centers, where it has been used as granite flooring tiles, granite wall coverings, red granite stairs, red granite window sills, red granite worktops, red granite kitchen counters, red granite kitchen islands, exterior building wall cladding tiles, elevator panels and due to its hard texture and durability you can use our Jhansi red granite as paving stone in constructing drives ways, walkways etc. World over, Jhansi red granite is also famous as jansi red granite, ruby red granite, bundela red granite, lalitpur red granite and janss red granite or simply an India red granite, the Jhansi red granite is one of the best red granites from India. We are a well-known Jhansi red granite manufacturing company offering you this beautiful granite in different finishes like polished, unpolished/sawn, flamed, antique, leather. From our granite factory in India, we produce and export Jhansi red granite in the form of slabs & tiles with a thickness tolerance of 1 mm and we assure polishing degree between 90 to 95. We export Jhansi red granite slabs and Jhansi red granite tiles in seaworthy professional wooden crate packing in 20 ft. Containers. All over the world India granites are very famous amongst architects & granite stone companies and they search them by the names of granite, India granit, India granit, granity India, granit-India, India-granit, marmur granit, India granito,ula India, India graniet, graniit, graniitti, grants, India granites, India granite. No matter whether you are an architect, a contractor or an investor or you run your own granite import export company or simply you want to build or renovate your house, you are in the right place for this beautiful India red granite as we are the best India suppliers of Jhansi red granite. 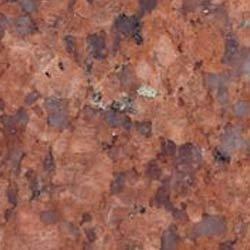 World over granite buyers choose our red granite material in three qualities, as per their import requirements. Our team of experts is at your complete disposal with full transparency. We will always hear you out, advise you and fill your orders timely at the most most competitive prices. So do not hesitate to contact us. Belim Marble Private Limited greets to its fast moving world of Stones and Marbles. Running swiftly in the arena of manufacturing and export of Natural Granite Marble, Feldspar Crystal, Mica, Indian Marble, Rainbow Sandstone and many more, we have set benchmarks as one of the renowned Black Granite Stone Manufacturers and Stone Handicraft Items exporters from India. We are the members of Sangemarmar Vyapar Mandal Makrana and Indian Chamber Of Commerce and are also awarded with Bhartiya Udoyg Ratan Award. Innovation and excellence are the keys of our organization that have assisted us in weaving the story of our success. Delivering quality products and prompt services, the company has set a strong foothold in the regions of most of Arab Countries, Australia, Pakistan, Bangladesh, many other Countries. Moreover, our products are high in demand and chiefly admired by our customers for their acme quality. We endeavor to provide absolute satisfaction to our customers in terms of quality and peerless services.